When Kobo announced the Kobo Glo last week in Japan, I'm sure they thought they were being quite clever in underselling the Kindle Paperwhite's price of 8,480 yen. Today Amazon showed that 2 can play at that game. The Kindle Paperwhite still hasn't shipped from Amazon.co.jp, but today Amazon dropped the price. They've matched the current price on the Kobo Glo, making the Japanese price of the KPW a steal. 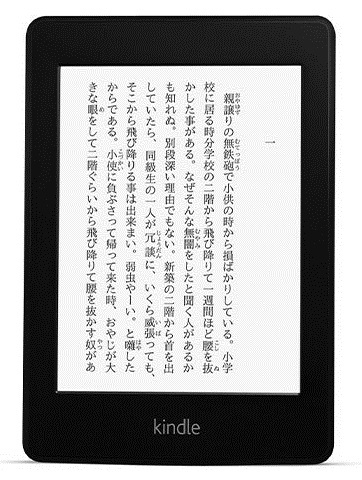 Amazon's newest ereader is now listed at under $100 in Japan. That's $40 lower than they're selling the ad-free model on Amazon.com, and it stands as a warning to the competition. Amazon will not be undersold. Just like we saw in 2010, Amazon is more than willing to get into a price war to make sure that doesn't happen. This is great for consumers in the short run, but in the long run it's going to thin out the competition. The only reason Kobo can afford to go toe-to-toe with Amazon is that they have Rakuten's deep pockets to hide in. This in effect puts Rakuten and Amazon in an elaborate game of chicken, and I cannot predict who will blink first. Unless the staring contest spreads out of Japan it won’t matter much to either player. But it is indeed a timely reminder that Amazon is serious about their pricing. Especially in the new, still developingmarkets. I hope they’ll battle for the lowest price here in Brazil too. Kobo and Cultura are expected to start selling ereaders and ebooks here this month. This race to the bottom is pretty ridiculous. What’s the point in winning if you’re not actually making a profit? There’s more than one way to make a profit. And there is such a thing as buying market share. As long as publishers demand DRM (which japanese publishers do, even more than in NorthAmerica) the lock-in effect makes subsidized hardware sales (like gaming consoless and cellphones) a viable tactic. The issue isn’t just about making a profit off the reader or even off each individual ebook but rather off each specific user account.